We’ve dyed pasta a few times now and used it to make pasta necklaces, pipecleaner caterpillars, and pasta collages, so when the Rockin’ Art Moms issued a macaroni challenge,* I was all over it. I was familiar with using pasta for kids arts and crafts but also excited to branch out and try something new. We ended up doing two new pasta art activities for kids, both hits. First, though, we dyed our pasta which is super simple. 1. Place your pasta shapes in the plastic bag, one bag per color. 2. Add a tablespoon or so of rubbing alcohol, close the top, and massage the bag to distribute the alcohol. 3. Open the bag, add your food coloring or liquid watercolor paint, close the bag again and massage to distribute the color. 4. Spread the pasta out on cookie sheets or a wax paper-lined surface to dry. Now you’re ready to use the colored pasta for kids art activities! We started with this pasta sculpture idea and returned to it several times over the past week. The kids especially liked working on these during our read-aloud time. Use the air dry clay as the base of your sculpture and poke pipe cleaners and/or dowels in the clay. String with pasta beads. Add additional pipe cleaners and pasta as desired until the sculpture is complete. You can also press colored pasta into the sculpture base or into air dry clay on it’s own. The kids each made and decorated doughnuts this way. And you can, of course, use the pasta shapes with just pipe cleaners, threading them on for bracelets, sculptures, spirals, or even letters. We made these when Maia had a friend over and everyone loved them! Glue the colored pasta shapes on the paper plate in a radiating mandala design. You can also make a face collage, as Maia did, or any other pasta design you like. Want more pasta art ideas? Now that you’re excited about the potential of pasta, check out some of these other arts and crafts projects you can make with it! Everyone who joins us in the Macaroni Challenge will be entered in an amazing Rockin’ Art Moms Gift Basket giveaway. The winner will be selected at random from the entries and announced on Instagram and the Rockin’ Art for Kids Facebook page on Sunday May 10th, 2015. So glad you like the ideas, Bar! And I bet your students would enjoy making the mandalas! Oh! You’re welcome, Bar! I bet the kids will enjoy the mandalas! How clever to dye pasta with food coloring! I must try it. Painting pasta turned out to quite messy ;) Food coloring and paper plates is now on the list of crafts supplies in need of getting. Thank you for all your valuable tips! I love all the creations! The photo of the dyed pasta in the top right makes me want to dive in and create. Gorgeous! 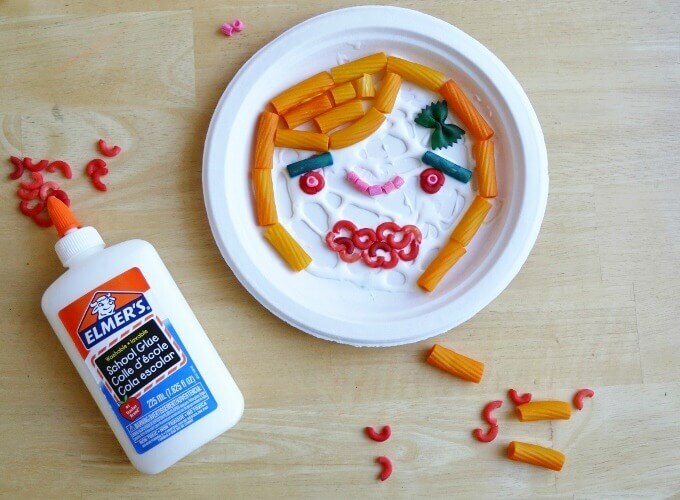 Love the pipe cleaners and pasta sculptures – great idea! AW!! I love this!! It’s a rainny weekend here in Argentina, so we’re going to do some of this!! Great ideas! Yay! So glad, Paula! Enjoy! Is this safe for toddlers? Never used rubbing alcohol before and wondered if my 20mth old put it in his mouth if it would be ok? Tobi, I would worry more about the choking hazard potential with a 20 month old. The rubbing alcohol dissipates quickly. These sculptures are so much fun, Jean! And I love how you combined the pasta with clay AND glue. Awesome. But how much pasta to the rubbing alcohol/dye?? I was wondering that too. My pasta doesn’t look as dark as yours. What am I doing wrong. Am I using to much alcohol? This is such a great idea! Where can we find those plastic containers you used to put the pasta in after its dyed? Hi Nalini! That’s a segmented hors d’oeuvre tray that I bought at a dollar store. You can find similar ones many places, including thrift stores. They are great for putting different collage materials in!